And foremost among the imperfect is me. Here you see my beaded red lace scarf. I wanted to relax it a bit prior to adding on the deep lace edging, in order to make doing so easier. So I began pinning it out for steaming. Pressing it is right out because of the beads, but steaming should have set the acrylic nicely, smoothing out the selvedges for ease of access. It’s obvious that I as I was tooling along nearing the finish line I didn’t pay attention. I missed catching all three loops of a tricky double decrease. When I applied light tension with the pins, the unsecured stitches popped out. The lace patterning is a bit complex here, otherwise I’d consider just mounting the fallen stitches on DPNs and re-knitting that little bit, securing the final stitch with a bit of darning. But I think that I’ll probably have to unpick the cast off row (here at the bottom of the photo), then unravel the final half motif or so, remount all the stitches, and re-knit. Provided of course that this is the ONLY mistake of this type in the entire 5.5 foot long piece. Moral of the story – overconfidence is bad. Check your work. Give a light tug every now and again to make sure your stitches are true. Without you, where would we all be! I purchased a $44 hank of yarn — and decided to wind it while on my lap. The silky part slid all over and about 20 hours later, I got it all wound into two balls. Can you use a crochet hook to pick up stitches, then use a yarn needle to sew a piece of the yarn into the pattern? I’ve done that & it came out great. But in your case, it is a fine yarn & may not work. Good luck. I will eventually try – remounting the stitches on DPNs, and trying to re-knit the destroyed bit, then fastening off the remaining single loop, but I am not optimistic. For most things, that’s easy. I do it all the time to fix all manner of silly problems. 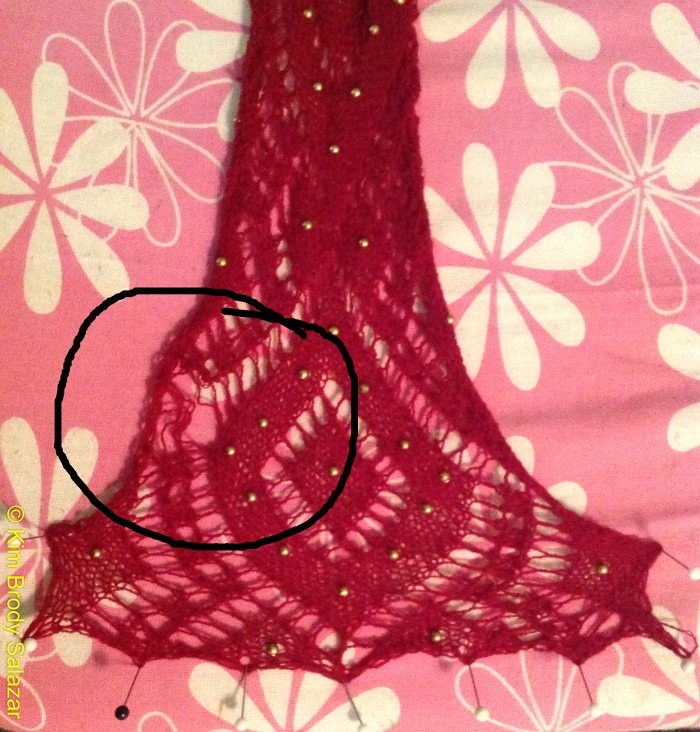 But this yarn is fine, and the lace pattern in those spider lines surrounding the center diamonds is a bit convoluted. Still it’s worth an initial shot before I ravel back the last six inches and reknit the whole end.